Spring has definitely sprung, here is your Bakersfield CA Real Estate Market Report – March 2018. The housing market in Bakersfield CA is heating up and movement is happening. Along with it getting warmer outside, people start to move around and enjoy the weather. The beautiful spring weather we see is directly attributed to the start of the busy real estate season, when the flowers bloom so do the sales! It’s getting busier, March came it with 1,538 homes available on the market for sale in comparison to 1,502 properties available last month in February. March also sold more homes than February, sold homes in March came in at 642 in comparison to February’s sold properties of 485. That was a 32% increase! Average days on market was 42 which is less than February’s number. So as a recap, more homes available for sale, more homes sold and in less time, not a bad month! 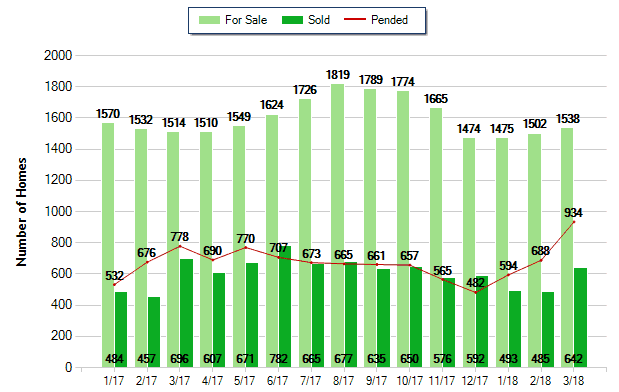 March completed the traditional seasonal transition from Neutral Market in February to now a Sellers Market in March. For a market to be considered neutral we must have at least three months of inventory available and currently we only 2 which makes our current market a Sellers Market. Just as suspected in Bakersfield CA Real Estate Market Report – February 2018 homes are being listed and sold quickly. As a seller, the time is now to list your home for sale. Seller’s choosing to list in a seller’s market will see lower days on market and often higher sale prices than listing in a buyers market. If you’re a seller considering selling your home then the time to act is now. Seller’s using Tholco to list their home get a no obligation free comparable market analysis and reduced commission fees. Our valuations are very accurate and we’ll show you what you need to do to sell your home fast and for top dollar! Take a moment and check out some recent testimonials from other sellers who have used our services! Click here to learn more about our reduced 1.9% commission program to help you put more money in your pocket! March sold properties came in at an average sale price of $241,000 which is a slight increase from February. Although it is a sellers market, buyers can still take advantage of some great deals with seller paid closing costs. The combination of a tax refund and some seller paid closing costs may be just what you need to get into your next home! The average for sale price for March 2018 in Bakersfield came in at $297,000 which is only slightly higher than the allowable FHA loan limits which means you don’t have to put much down! With the average days on market for March being only 42 days buyers will want to act quickly as homes are definitely selling fast! For more information on Bakersfield CA Real Estate Market Report – March 2018, feel free to contact us anytime. If you’re considering selling your home, click here to setup your free no obligation consultation and home valuation. Additionally, feel free to submit your comments below.